In densely-wooded plateau country southeast of Flagstaff, the small seasonal stream Walnut Creek has carved a 600 foot deep canyon as it flows east, eventually joining the Little Colorado River en route to the Grand Canyon. 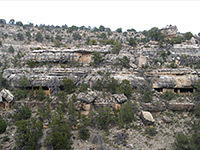 The exposed Kaibab limestone that forms the upper third of the canyon walls occurs in various layers of slightly differing hardness, some of which have eroded more rapidly forming shallow alcoves; during the 12th to 13th centuries many were used by the local Sinagua Indians who constructed cave-dwellings along the steep well-protected ledges, high above the canyon floor. Today, the appearance of the canyon and ruins is quite reminiscent of the more well known Mesa Verde National Park in Colorado, just on a smaller scale, but the proximity to Flagstaff ensures a steady stream of visitors. Walnut Canyon National Monument is easily reached from Flagstaff, being just 7 miles east along I-40 and another 3 miles south on a spur road starting at exit 204 (see map). The park has a good visitor center with a small museum; the building is perched on the cliff edge and enjoys panoramic views east and west. Many of the ancient dwellings were built around a U-shaped meander in the canyon, where the creek circles around three sides of a high rocky plateau, almost creating an 'island', and this region now forms the central attraction of the national monument. There are many other ruins in the 20 by 10 mile area but none are accessible to the public. The dramatic location of the buildings and their good state of preservation makes Walnut Canyon perhaps the most interesting of the NPS historical sites in Arizona to explore. Other contemporary habitations of the Sinagua people are preserved in the nearby Tuzigoot and Montezuma Castle monuments. There is no campsite in Walnut Canyon National Monument but plenty of accommodation options in Flagstaff, including a large selection of hotels. 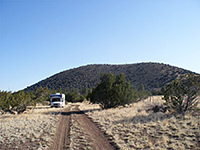 For free national forest camping the nearest good sites are in volcanic country along Leupp Road, 15 miles northeast. 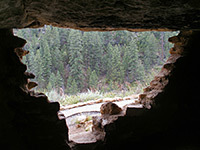 Two footpaths allow for a closer look at the Walnut Canyon ruins; the least exciting is the 0.7 mile Rim Trail, which traverses flat land along the canyon rim and ends at a viewpoint on the edge, from where the island can be seen to the west. 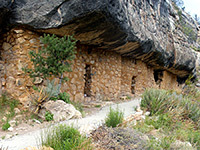 A branch of the path passes a few scattered ruins including a restored pit house, protected beneath an oversized wooden canopy, and the walls from a two-room pueblo dwelling. Better and much more popular, although slightly more strenuous, is the 0.9 mile Island Trail, a loop path that descends steeply (by 185 feet) via a series of 240 steps, then circles the island. Entry is through the visitor center, and the top of the trail has several notices warning of its steepness, as even though the route is very easy for a seasoned hiker, it presents a challenge to those unaccustomed to exercise at this high elevation (7,000 feet) - witness one entry in the comments book requesting that the NPS should provide bottled oxygen to help those on the return journey. The trail passes alongside the remains of about 20 separate dwellings, a few of which are quite intact, including a front wall with rectangular doorway, though visitors are advised by the NPS not to go inside owing to 'dangerous rodents' living there. The Rim Trail also has good views of the cliffs opposite, which have other ruins clearly visible, since the reddish stones used by the Sinagua contrast well with the white striated limestone layers of the canyon. The trail is closed relatively early in the afternoon (4 pm), so that the park rangers can check no-one is attempting to stay overnight, and to allow plenty of time for slower moving visitors to make the climb back to the rim. Pets are not allowed on either trail, nor in the park buildings. 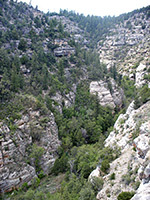 The vegetation in Walnut Canyon is varied and abundant, and changes noticeably in different parts of the gorge. The cooler, shady, north-facing walls are covered by fir and ponderosa pine trees, representative of the Pacific Northwest, while the sunny, south-facing slopes have agaves and several species of cactus including opuntia, echinocereus and cholla - typical of the upper Sonoran desert in south central Arizona. The valley floor is home to many examples of the walnut trees from which the canyon and creek were named. The rocks in the canyon walls are formed of three distinct layers - the upper third, where the cliff dwellings are found, is Kaibab limestone, which overlies steep, scrub covered slopes of the Toroweap Formation, while the lowest third is the sheer-walled, cross-bedded Coconino sandstone. The nearest town with hotels close to Walnut Canyon National Monument is Flagstaff (10 miles) - follow the link for descriptions, map and online reservations. PDF format map of Walnut Canyon National Monument, from the National Park Service (92 kb).